Cholera is an intestinal infection. The bacterium is spread through food or water that has been contaminated by the feces of an infected person. One to five days after infection, patients develop severe, painless, watery diarrhea, often called “rice-water” stools. 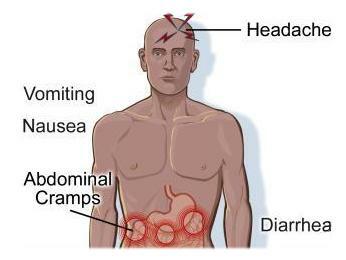 Vomiting also occurs in most patients. Usually, the symptoms are relatively mild and respond to oral re-dehydration. Severe cases of cholera (10-20%) can cause life-threatening dehydration. Treatment involves oral and/or intravenous fluid replacement and antibiotics, which reduce the volume and duration of diarrhea. An injected cholera vaccine is available in many countries but is rarely recommended; immunity is unreliable and may only last a few months. This vaccine is no longer available in the United States. Two more effective oral vaccines are available in an increasing number of countries, including Canada and a number of European nations. One is an oral live vaccine used specifically against cholera. The other, the oral B-subunit vaccine Dukoral, gives good protection against cholera and halves the risk of developing traveler’s diarrhea caused by ETEC (enterotoxigenic E.coli). ETEC is one of the more common causes of traveler’s diarrhea. However, travelers who use this vaccine should also carry self-treatment remedies in the event that they develop diarrhea that is not caused by ETEC. If visiting an area infected with cholera, drink only boiled or bottled water, water that has been treated with chlorine or iodine, or carbonated beverages. Avoid ice, as it may have been made with unsafe water. Choose food that has been thoroughly cooked while fresh and is served hot. Avoid street vendors, pre-peeled fruit or salad, fish and shellfish. Fruit that you wash and peel yourself is safe. Cholera epidemics tend to occur in areas where sanitary conditions have deteriorated, such as refugee camps and war zones. With the exception of health and relief workers, cholera rarely infects travelers who avoid highly unsanitary areas. Medical personnel and relief workers traveling to cholera-infected areas should consider being vaccinated against cholera.